Have a look at this photograph that shows just how much Sheffield's east end has changed. Anyone know what the buildings are on the bottom left hand corner of the picture are/were? The winding road is Broad Street, as it bends to the right the single white building on the left of the road is the Durham Ox pub. Nice picture.. my Dad was a furnace man at Firth Vicars I think it was on Weedon Street somewhere amongst or nearby that picture. This picture was taken in July 1967 and was most probably a Saturday or a Sunday. 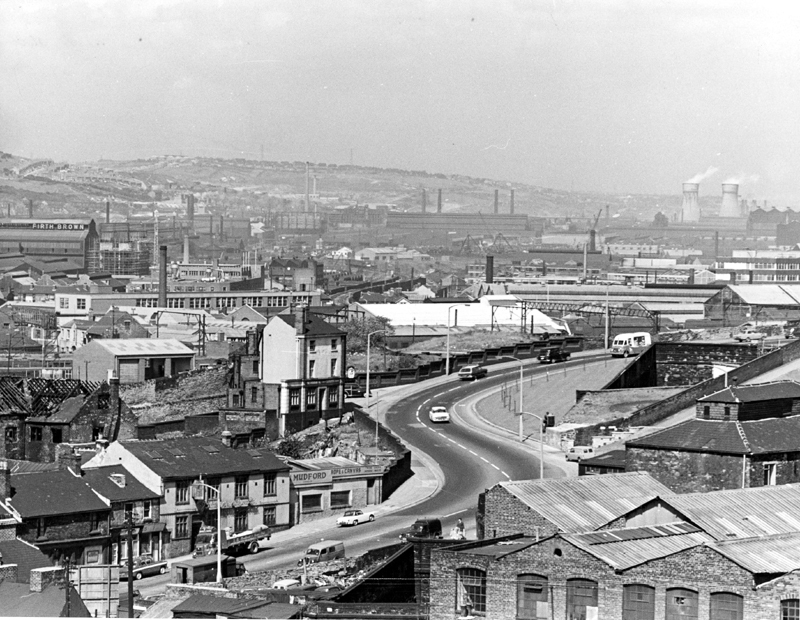 I'm guessing that as during the week you would have been hard pressed to see the ice-cream van at the top of the hill, never mind the Tinsley Cooling Towers! The building that looks like a pub frontage (behind the flat back wagon) is JH Mudford & Sons Ltd. a long established Sheffield maker of rope, twine, canvas and tarpaulin. Their premises extend up the hill to the buildings behind the little white sports car. Sadly all gone now, just the Durham Ox pub remaining (white building far right), but for how much longer? Using a little Google 3D imagery, the modern view is almost unrecognisable, apart from Broad Street and the railway tunnels in the foreground and Wincobank Hill on the left horizon. The modern view of the Don Valley is all but obscured by the flats on Broad Street, The Capita building at the junction of Parkway / Derek Dooley Way (the blue & black high-rise) and the Veiola facility on Bernard Road. The Tinsley cooling towers would have been visible in between the incinerator chimney and the furnace house (the Tinsley viaduct is just visible on the full size modern image). However, no other landmark or buildings can be matched between old and new. The gasometers on Upwell Street are long gone, as is most of the industrial landscape between the city centre and the M1. At least there are more trees now (until Amey find them). There are some old buildings still standing further down by Park Sq roundabout, including the now closed Old Harrow pub, and the sweet shop. Might be worth getting a photo before they go. If you look at the old photo, on the grass verge opposite the Durham Ox, you can see some staked saplings following the curve of the road. Hop into Street view on Google maps today at that point and you can see the same trees (minus a couple unfortunately and maybe a couple of younger ones re-planted?) with 50 years growth and for some reason a car parked in between most of them. Probably why the grass is a little threadbare? I was all set to reel off the businesses on the 'odd' side of Broad Street, as shown in the original photo. I could make out an 'E.M. Hollis' one door down from Mudfords and others right down to the Old Blue Ball PH. But, looking at my 1970 Kelly's the listings stop at No.71, Mrs Cox's tobacconist shop, just two buildings past Broad Street Lane??? I wonder if the fire in April gutted Mudfords and the buidings below, such that they had to be demolished? 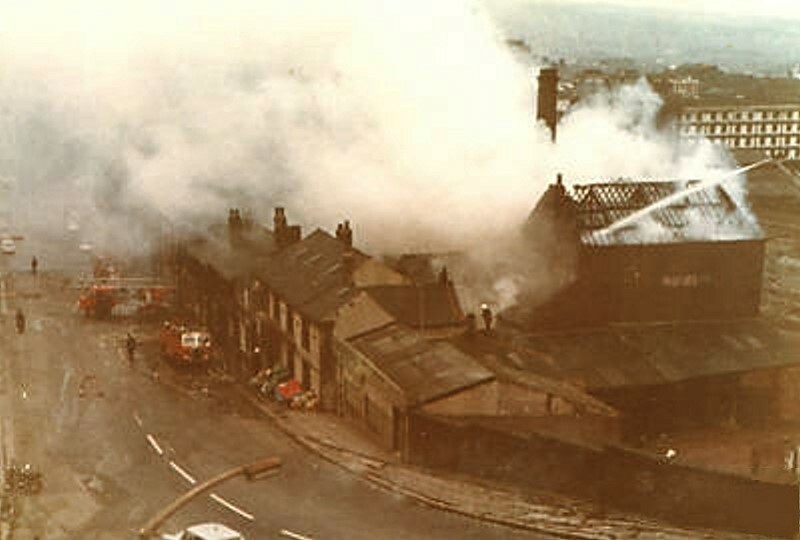 If that is the case, the original image on this thread, dated 1967/07 (July) cannot be dated correctly, as by then the buildings 73 > Mudfords had burned down?! If you look closely at the photo of the fire, there is a fire fighter on the ridge tiles of No.73 (brave fella!) training his hose on the back of the building. .. but in '55, they are all there, large as life? Mudfords and the rest??? Looking at the 1963-1970 Broad Street 1/1250 that you have kindly identified on 'Old Maps', i think you will find that the area shown is a composite of different versions of the series of the 1/1250's started in Sheffield in the early 1950's. On any single copy of a printed sheet there is a letter just below the bottom LH corner indicating which issue it is (i.e. A is the first edition, B the first revision, and so on).This usually meant that any substantial changes to a particular sheet would be done by a Field Surveyor on 'Continuous Revision' duties and could be asked for by Statutory Undertakers (Water,Electricity,Gas etc.) so the letter gave some idea of how many revisions had been carried out. The figures giving heights were changed from Imperial to Metric around 1970, the Government having set up a quango to deal with the Change to Metric in about 1968 and the OS, whose surveyors had worked in metric measurements anyway, either converted existing data (Benchmarks and Spot Heights) or used new levelling information where available but that was a separate group with a wider remit. That portion of the Broad Street 1963 plan includes a later revision (probably 1970) as you can see from the missing part of the Bernard Gardens/Higher pavement block. As stated in the first paragraph that online map is a composite and you can usually find on most OS maps information regarding dates of surveys and printing. Thanks for the info. I don't know much about the science (or art?) of cartography, but it does explain why the map image is appears 'mosaiced' and there are several more continuity errors (e.g. a disjointed section of Netherthorpe Road, over to the left (west) of the map). However, all this taken into account, I was still intrigued to find out why the 'Park Rope and Canvas Works' (aka J.H. Mudford & Son) and adjacent buildings suddenly disappeared from maps and was not listed in Kellys 1970, when it was visible on the Picture Sheffield photographs dated in the same era? Were they consumed by fire on 23 April 1967, or so badly damaged they were abandoned and demolished? The plan SteveHB has posted is part of Map 94 (SK3687 NW) on this site and looks like the 1953/54 date of the original survey giving an indication of the extent of the 'Works'. On the original photograph (July 1967) severe roof damage is evident to the rear of the premises the result of the earlier fire in April 1967 so we can reasonably assume that demolition took place within the next three years evidenced by the 1970 'metric' plan. I hope someone can confirm with greater accuracy the clearance date of that site. Incidentally starting at No 34 Broad Street I wonder how long it would have taken, visiting each of the Public Houses (travelling eastwards), to reach the Durham Ox in those days. This looks to be the same fire, sorry but no date. I lived in the Durham Ox with my parents and grandparents from the early 1950's to the early 80's. I remember Mudfords well, below them was a newsagents, a chip shop, a hardware shop, a tobacconists and a dance school. On the opposite side of the road was a betting shop, a barbers (I think), a garage, Granellis and another car repair shop which had great excitement once because they were fixing Diana Dors' car. Opposite the Durham Ox were three cottages, but, as a child I rarely got to play with the children there because the road was so busy (no Parkway then, just a railway line). On more than one occasion vehicles speeding down the road failed to take the bend and finished up embedded in our door/wall. Above the Ox was a brewery depot, which started out as Ind Coop & Alsopp, later to be Allied Breweries and Tetleys. It was closed when Tetleys moved their offices to Hillsborough. I no longer live in Sheffield and was so sad to see the state of the Durham Ox now, I hope somebody takes pity on it and does it up, although I am sure the resident ghost might object. I don't really believe in such things but after the pub caught fire on Christmas Day 1973 (I think) it was repaired with some changes and weird things started happening. For example the taps on the beer barrels would be turned to off even though the doors to them were locked and things would fly off shelves. The weirdest thing of all was we would find customers chatting to themselves and when asked who they were talking to they all said it was a man with a funny hand!! !